Remember I posted about how I pulled bags and bags of ivy out of that bed earlier in March-April. But since I didn’t get all the ivy out, now that spring is well-here, the ivy is growing very well again. (You can look up previous posts on my efforts to rid this bed of this ivy!) In fact, the ivy seems better than it’s been in the past few years, probably because of the effort I put forth to cut it out. What’s left has more room to grow! What also has room to grow now are the deutzias. They are just starting to bloom and already I can see that they are bigger and healthier than before, without all that ivy smothering them. 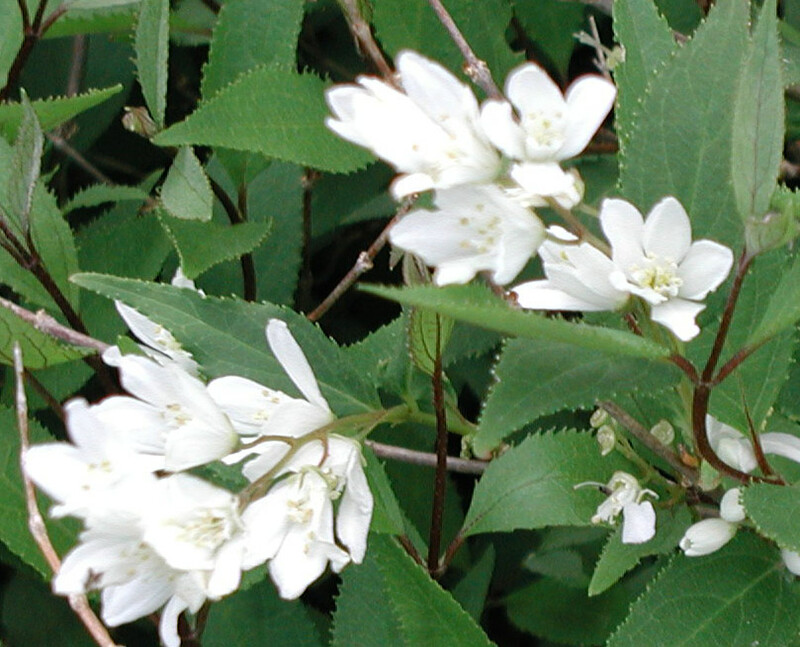 Deutzia is one of those shrubs that you don’t see too often, which is a shame. I’ve had no trouble with mine. It stays small and blooms in mid to late May. 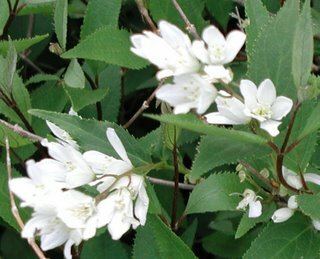 I have a theory as to why you don’t see more of deutzia… that’s because the “big” national nurseries who sell to the "big box" stores don’t want to bother with it. It’s not well-known, so the “general public” may not be willing to buy it. Therefore, they won’t try sell it. The "big box" stores prefer to handle only the yews, junipers, boxwoods, burning bushes, rhodos and azaleas and other shrubs that I see over and over again until I just want to scream. Get away from the big box stores and get ye to a local nursery/garden center! A locally owned garden center most likely offers locally grown plants and is willing to stock different shrubs, and has people who know what they are talking about, who are willing to explain about these less common but more interesting shrubs, AND who will actually take care of the nursery stock before it is sold! I’ve been through the garden centers at the big box stores and can’t believe the lack of care their employees give the plants. 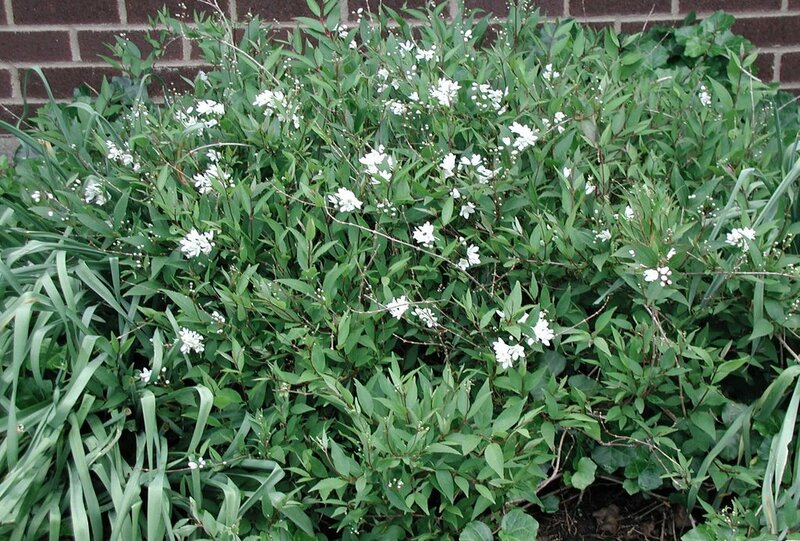 Give me deutzias, hypericums, kerrias, viburnums, even lilacs (but not common lilacs!). How about Gold Tide forsythia? I’ve got one I purchased at a local garden center and it is a bright yellow ray of sunshine in the spring before anything else is blooming. Contrast that with some other forsythia that I bought at a hardware/garden ‘big box’ store that has failed to bloom in over five years! And no, I am not trimming it at the wrong time cutting off all the flowers buds. I’ve not trimmed it all. It’s just not blooming! Who knows what variety it really is? (After that rant, I think I’ll add those forsythia to the list of plants that JUST AREN’T PEFORMING, so it’s bye-bye to the compost bin). Thanks, I feel better now. I think I’ll plan a trip to a LOCAL nursery sometime soon! I have a forsythia from a big box store Mine blooms beautifully every year. I actually have three. Maybe yours doesn't like where it is planted. One of mine is on the north side, by the garage, the other two on the south side, just outside the garden fence. I trim them back every year, after they finish blooming and they are doing good. Of course, my cranberry viburnums on the east side (from a big box) have always seem to struggle, but have held on for years. Now, someone tell me how to get rid of RABBITS please. They are destroying most of my annuals and lillies. If I knew how to get rid of rabbits, I'd be a wealthy and happier person. They've eaten some of my pea vines. They seem to leave the lettuce alone, or maybe I planted enough that I'm not missing what they are eating! I think the forsythia I got is just a "dog".